Im Białowieża Urwald an Polens Grenze zu Weißrussland ist nicht der Bär los - viel schlimmer: es sind die Holzfäller. Und weil die einen Riesenschaden anrichten, regt sich seit mehreren Wochen aktiver Widerstand gegen diese staatlich betriebene Holzfällerei in einem Wald, der eigentlich geschützt und auf alle Fälle erhaltenswert ist. Was ist passiert? Nach jahrelangen Bemühungen, den Holzeinschlag zu reduzieren und die geschützten Flächen zu vergrößern, verfolgt die neue Regierung bedauerlicherweise genau die gegengesetzten Ziele: einen Borkenkäferbefall als Ausrede nutzend wurde der Holzeinschlag in bis dahin ungenutzte Teile des Waldes vorangetrieben. In der Zeit von Januar bis Ende April wurden über 10.000 Bäume eingeschlagen, viele auf Flächen mit über 100 Jahre alten Bäumen. 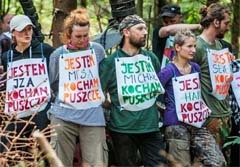 Weil der Białowieża Urwald, der der letzte in Europa erhaltene Wald und ein UNESCO Welterbe ist, entgegen aller Expertenaufrufe und trotz heftiger Proteste akut bedroht ist, haben polnische Umweltschützer zu einer internationalen Solidaritätswoche aufgerufen, sie haben für diese Woche um aktive Unterstützung vor Ort sowie phantasievolle Aktionen europaweit gebeten. 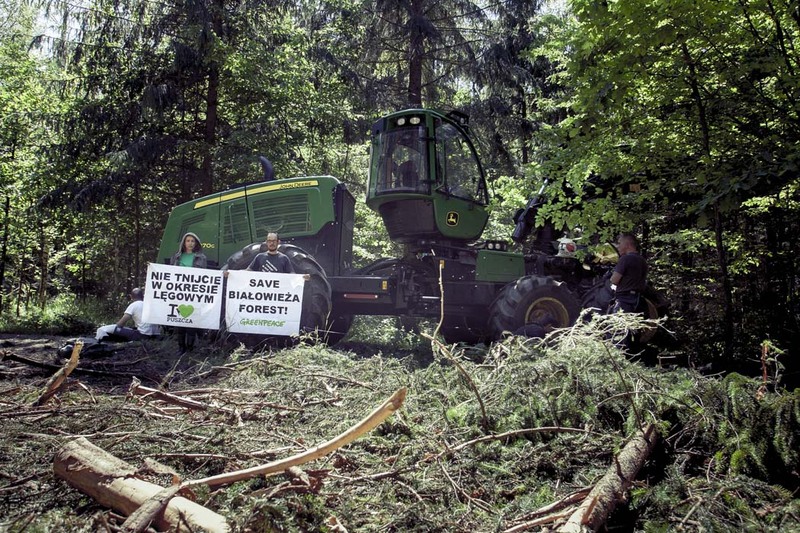 The situation is in the Bialowieza Forest building up. Activists from all over Poland are arriving to the forest. 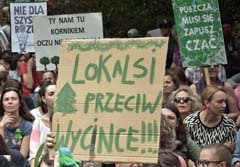 The same about forest guards, as the general director of State Forests (Lasy Panstwowe), Konrad Tomaszewski, issued a decision according to which each of the regional forest management bodies (there are 17 of them in Poland) has to send 3 people to the Bialowieza Forest to support local forest guards. They are to create reinforced intervention teams that will work in two shitfs daily from Monday to Saturday. The teams will be activated during the UNESCO summit. They are to guard the harvesting machines so that they could keep working. 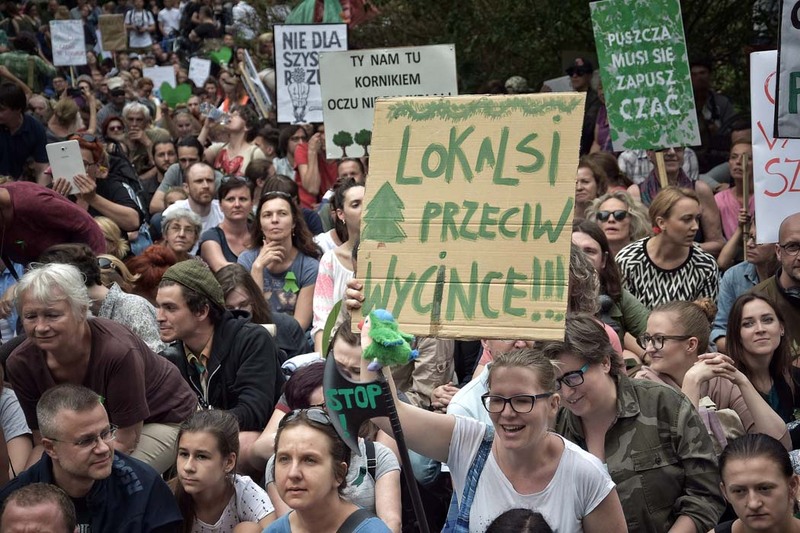 They will also watch the Forest, so that nobody breaks the access ban and enters the Forest, where destruction is taking place at an incredible speed. 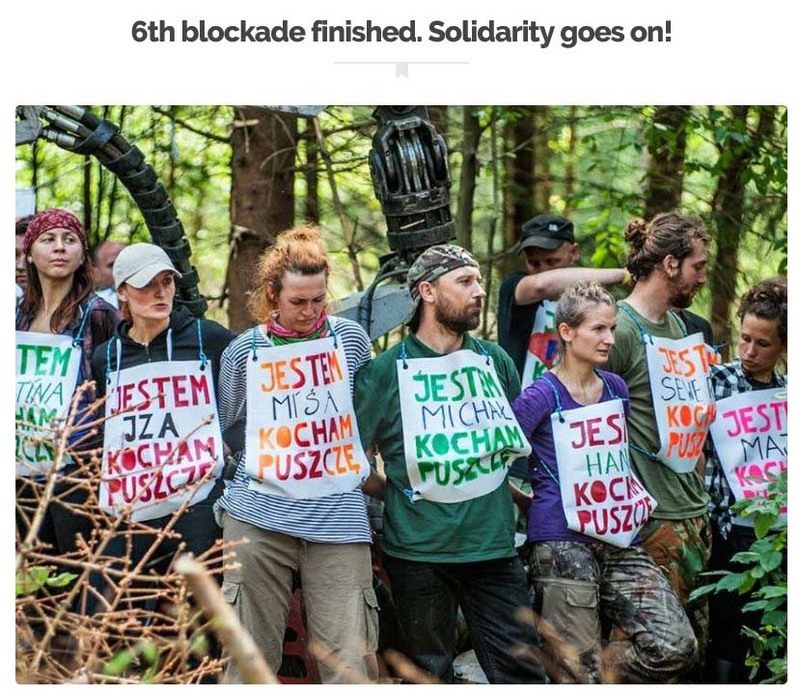 Meanwhile, the 6th blockade of heavy machines started deep in the forest today. Once again activists with their bodies and risking further legal consequences try to stop the destruction of priceless ecosystem. They were not dicouraged by heavy storms that were passing here today, nor by the fact that legal procedures were started againts many activists or just their supporters. In the current days more and more people are getting letters from the prosecutors, informing them about charges. Some persons were charged with over 10,000 PLN fines. The money should be paid in 7 days’ time or their cases will be taken to court. The fines were calculated according to potential loss of the State Forests (one of the richest state owned companies that manages a third part of our country) due to machine blockades. However, the people who received the fines, did not take active part in any of the blockades. They just appeared on the site and showed solidarity by being there and greeting the activits.